Growth share matrix from BCG, developed in 1968. Older ideas, seen anew, can be helpful to business owners. In that spirit, I have highlighted Economies of Scale and Michael Porter’s Five Forces previously. Today, I highlight another older idea in the Boston Consulting Group (BCG) Growth Share Matrix that was developed by the global consulting group in 1968. It is another simple, but helpful, framework for thinking about elements of your business. It provides one lens on how to prioritize and manage a portfolio of projects, initiatives, businesses, or any other elements of a portfolio. In other posts I have explored how helpful frameworks like this one can be used in “theories and frameworks” as with Clayton Christensen at the Harvard Business School and with “mental models” from Charlie Munger of Berkshire Hathaway. 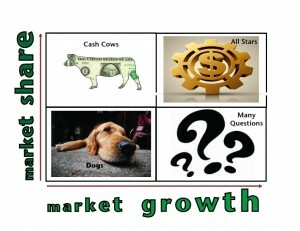 BCG’s Growth Share Matrix focuses on two concepts: market share and market growth. Their classic 2 x 2 matrix creates four quadrants. All Stars. These are projects that have a high market share and high growth. The idea is that you should keep investing in these stars to maximize your opportunities. Question Marks. With high growth but low market share, the question is to weigh carefully the risks and rewards of these projects or businesses: whether or not your project can survive in the long term with a low market share. Cash Cows. BCG suggests these should be milked for cash as they have high market share and low growth. Often, I think these types of businesses are undervalued even though they could remain as solid contributors to your overall effort for a long time to come. Dogs. BCG advises to divest dogs that have low market share and low growth. Developed with business conglomerates in mind, this framework can still be applied to other portfolios such as a portfolio of products or services. If you own one business, this framework may also help you decide how to manage your business. If it is a cash cow, maybe you are better off milking the cash cow and diversifying your investments into other assets. Or if you own a dog, maybe it is time to sell it to a leader in the industry and focus your efforts elsewhere. In my Greybull Stewardship investments I look for Stars who need some capital or some management bandwidth to ride the market growth opening for them, or occasionally I look for Cash Cows generating cash that can be used to invest in Stars. In addition to the BCG Growth Share Matrix, below are some of my posts on other charts, graphs, and frameworks.